Included in our list are some of the finest evergreen hedging species from the very fast growing Green Leylandii hedging to the slower and majestic English Yew as well as excellent screening species including Scots Pine and Norway Spruce. We have all kinds of Conifer hedges including the fastest growing Leylandii varieties. Our Yew and Thuja hedges are well worth considering, they trim into beautiful hedges and both will re-grow after being pruned back to the old wood. 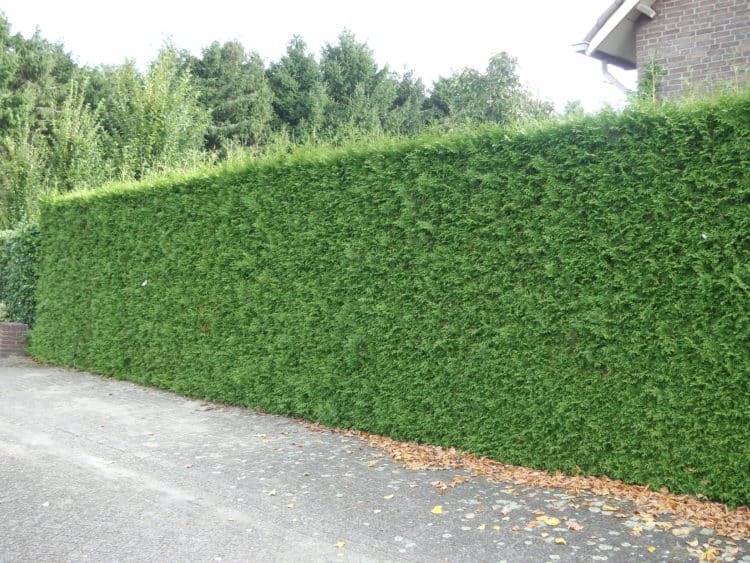 Conifer hedges – Conifer hedging is a versatile and much used type of hedging for privacy and filtering of pollution. There are many types of conifer that can be used, the most well known being the fast growing Cupressocyparis (Green Leylandii) which is also available in gold (Castlewellan Gold). Thuja Plicata Atrovirens (Western Red Cedar) is a great alternative to Leylandii. It is slightly slower growing at 40-60cm per year making it a little easier to maintain compared to the Green Leylandii hedging plants that grow at approximately 75-90cm per year. One of the advantages of Thuja is that it can be cut back hard into the old wood and will still re-grow, handy to know if your Thuja hedge has become too large. Another useful hedging conifer is Thuja Brabant (White Cedar, Thuja occidentalis ‘Brabant’). This tough and hardy conifer has an upright habit, it retains its glossy dark green foliage all through winter. For a smaller conifer hedges, Emerald Thuja Smaragd (Thuja occidentalis ‘Smaragd’) is easily maintained at heights of 120cm upwards, with its attractive sprays of emerald green foliage it makes a striking addition to the garden and doesn’t take up too much space. A more traditional quintessentially English hedge from the conifer family is the English Yew hedging plants (Taxus baccata), suitable to grow in most soil types providing the site is free draining. It can be tightly clipped into neat shapes and precise lines and many British stately homes boast very old Yew hedges clipped into fanciful shapes. 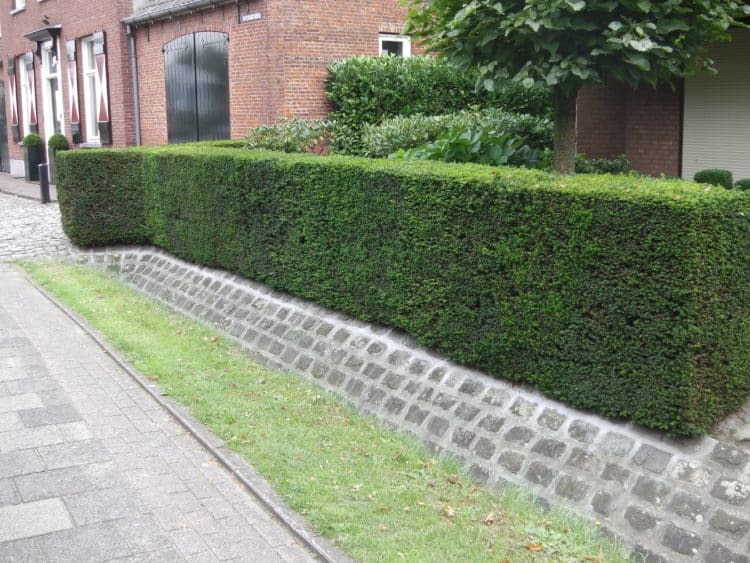 The slower growing Taxus baccata fastigiata (Irish Yew hedge) typically grows in an upright columnar shape and is a favourite to use as an architectural feature. It makes a tight knitted hedge and needs very little if any pruning. Both varieties of Yew hedging plants are very long lived. If you are looking for a native tall ornamental windbreak/shelter belt, then Pinus sylvestris (Scots Pine) is a large conifer with attractive blue-green needles and grows approximately 30-50cm per year. Without a doubt, although much maligned, conifer hedging can provide all year round screening, a green canvas against which other shrubs and plants shine and create architectural year round interest in the garden. You can click through to browse further information, sizes and prices of the conifer hedges below, or call our sales team of friendly experts on if you need any further help on 01580 765600, or drop us a line via our contact page.